This photograph is nearly two years old now. 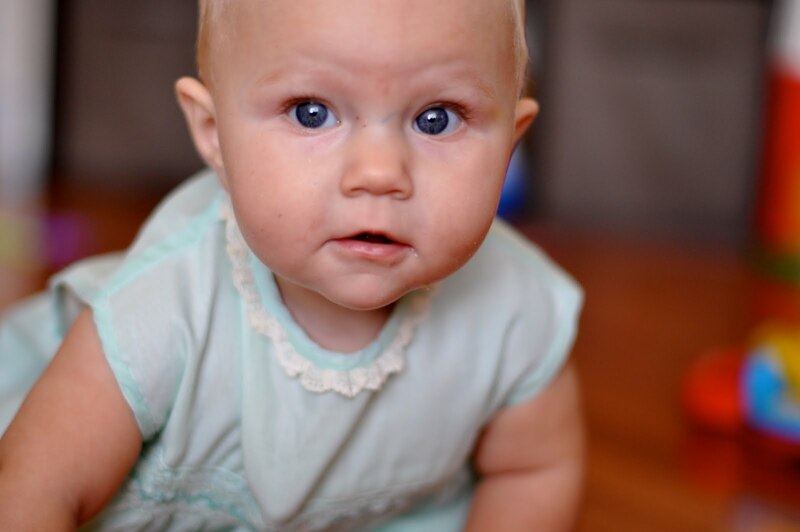 This is my youngest daughter Stella at six or seven or nine months old, in a dress my mother wore when she was a baby, staring at me as I documented her awkward and determined attempts at learning to crawl. I sat on the hardwood floor of our rented townhome on the outskirts of Austin, Texas, I gazed at this beautiful creature as though I’d never seen a baby before – as though I was a tourist in Papua New Guinea drinking in a new and wonderful and rich and foreign land and its people – and soaked it in. I drank this little girl up, and swallowed hard with the full weight that came with the knowledge that this – that she – would be the last of my babies I would ever watch grow. Today, on the precipice of nothing in particular,and everything all at once, I wonder if that’s really the truth. If Stella really is the final fruits of my womb. If she is the last kidlet my uterus has to expel. The last first cuddle I’ll feel as a mother. The last first tooth. The last first day of school. The last poorly lit and improperly exposed baby photo I’ll take. The last stretch mark and vomit covered t-shirt and sleepless night. And I wonder if I’m ready for that ship to sail. If I’m ready to watch it slip quietly into the blanket of night, and not feel remorse or the crushing weight of regret as it drifts off into forever. As I sit here typing this garbled mess of feeling and uncertainty that has absolutely-nothing-related-or-to-do-with-photography, I am convincing myself that I am okay with that. That my life is chaotic and wonderful and whole and perfect and imperfect and crazy and every little thing left in between….just as it is. That it’s time for the third baby ship to sail. That it’s time for me to let that go. I just don’t know if I should. If I’m being honest, I don’t know that I can. I don’t know if I want to have another baby, you guys. But the scary-as-hell truth is, that I don’t know that I don’t. I don’t know that I’m done nurturing or being puked on or kissing scraped knees or losing baby weight or hating myself pregnant. I like that I’m not doing any of those things right now – but that’s because my sister ship is still safe in its harbor. It seems, however, the the tide is coming in, the winds are picking up, and it’s time to set out to sea. Which means I have one hell of a decision to make. Proverbial night is falling, friends. The ship is setting sail. It’s time for me to get on, or let go. I too have been on the same cruise ship for awhile now…however now that I am AMA(Advanced Maternal Age), the decision is getting easier and easier. I am getting to the point that I like sleep and with that extra sleep, I can take my kids and do more things. I find that with two kids it is easy to travel and we want to do a lot of that. I think the one thing I have learned the most in the last year or two is that instead of panicking (which I do a lot ) or making haste decisions, I need to stop and wait and see what the universe decides. AND in almost every situation, where i was to make a decision, the answer presented itself. I guess what I am saying is, if you aren’t sure, then stop don’t decide right now. See what happens. DO IT! and by that I mean have another. What if its a boy!! What if its another girl??? One would be amazing and you know the other will be cute cuz you already have two that are adorbs. If you are fighting with the question then… yes. I think yes. You write so beautifully, thoughtfully and with so much emotion. I got to feel what you feel and I say yes! Not much advice here either. I feel the exact same way but know I’m not ready to make the final decision. The decision I did make was to keep the option for now. I’ve heard what you all have, that you wouldn’t regret it if you did. I wish you the best and believe that what is meant for you and your family is what it will be. I get crazy baby fever when around infants and can’t quite give that possibility for me up yet. I’ll come to you for advice when it is time for me to decide;). Thinking of you! You have a full, lovely life, enriched with the unabated love and support of a man, and pure devotion of two beautiful girls. If you are feeling a sense of emptiness, a hole to fill, then decide what the emptiness is. If it’s the need for another child, you will become pregnant. It just will be. If it’s the need for something else, it will present itself to you. Be aware, be open to the message so it can reach you. Be still. Your answer will present itself. I’m also in no position to give advice, but I will say two things: 1) I decided long ago that if I were ever to become a mom it would be by adoption. I’m about to turn 35 and I’m still giving myself a couple more years. I don’t hew to the notion of 50 and 60-year-olds giving birth, but I think your proverbial ship could sit in the harbor for a bit longer while you make this decision! 2) Tangentially, I have 4 sisters, and most of us are more than 5 years apart. We’re really close and yet very individualistic because of the gaps in our ages. We’ve always seen it as something of a gift from our mom. All that being said, you, Athena, are a unique mother among mothers, and another child of yours in the world would be a boon to us all. You are the kind of people who should be having babies. Or just listen to your mom. That’s some good advice right there. P.S. You are an AMAZING writer.